Lutfur Rahman will not have appreciated that his first matter of council business last night (October 27) as the borough’s new mayor was a £10,000 cut to his salary. Appearing at the first council meeting at the Town Hall in Mulberry Place since his election, he spoke of his pride in his new role in front of over 100 supporters in the public gallery. Tower Hamlet’s first-ever directly-elected mayor also rewarded his campaign manager, Ohid Ahmed, by appointing him as deputy mayor but will wait until November 11 to announce his cabinet. Mr Rahman’s joy at the occasion soon turned to dismay though as he accused the council’s Labour Group of pettiness in putting forward an amendment to cut his annual salary from £75,095 to £65,000. The amendment to a constitutional report, which also limits the number of paid advisers the Mayor can employ, was passed by the council. Mayor Rahman said: “It saddens me on the first day that we indulge in this kind of petty politics. “During my two years as council leader I was the only leader in this council’s history that took a 25 per cent pay cut for the year. “Let me say, I don’t do this for money but let me remind you I have given up a successful legal career and a partnership in a legal firm. The mayors of Hackney, Lewisham and Newham earn salaries of between £75,000 and £78,000 a year. Speaking to the council, Labour councillor Josh Peck, chairman of the working group which put forward the constitutional report, said there had been an ‘oversight’ after the report was originally agreed in August. At an internal Labour meeting in September, members narrowly voted to increase the salary for the full-time role to £75,000 but Mr Peck told The Advertiser today this shouldn’t have been included in the report because it was not agreed by other parties. Last night, Labour, Conservative and Lib Dem councillors all voted in favour of the amendment. Mr Peck replied that the lower salary was set before mayoral candidates were selected and said the new mayor proposed a salary of £32,000 before he was shortlisted. This coming Wednesday, the full council will in Item 11 debate the pay arrangements for elected representatives over the coming year. In an email to councillors eight days ago, Mayor John Biggs explained the proposal from the majority Labour group (which is likely to pass). First off, let’s have these facts in our minds: 1) deep Government cuts affecting frontline services; 2) pay for most local government employees is proposed to go up by just 1% this year; 3) councillors’ pay has remained frozen for a number of years; 4) some councillors rely on their allowances as sole (declared) income (not a good thing); and 5) very many councillors work extremely hard, while others do not. Under these proposals, there will be inflation-busting pay rises for everyone. Basic pay for all councillors will go up by 5.3%. Oli Rahman would see his Special Responsibility Allowance for being leader of the THING go up to £11,300 (7.5%); and Tory leader Peter Golds would have a 40% jump in his SRA from £5,709 to £8,000. The total pot paid to councillors for all these roles would rise 6%. But most of the political backlash will no doubt focus on John Biggs. As I’m sure you’ve already spotted, the proposed mayoral salary goes back to the figure slashed by Labour more than five years ago – to £75,000. He has announced he accept only half that rise this year (to around £70k), and will take the rest next year if progress has been made. And although he’s entitled to £11,300 as a majority group leader, I think I’m right in saying he doesn’t take that. The likes of Oli will also point out that John’s pay rise comes just a week or so after the loss of his salary for being a GLA member. I think this is a difficult one. Pay at some levels of local government is outrageously poor; at others it’s ridiculously high. The council has just recruited a new head of communications, for example, at a salary of around £100k. Many believe that’s way too high, while others believe it needs pitching at that level to attract good candidates. But whatever the merits of that salary, should the executive mayor’s post, done properly, be valued almost a third lower? Because of the stand-off between the former mayor and council there had been no proper review of allowances for some years. The proper time for such changes is in my view in the period immediately following the elections but this was missed. I am proposing a number of changes to committees and structures and as a part of this a short review of allowances. I have informed and involved the opposition leaders in these discussions. The main change is to update the general allowance paid to all members. Increases are also proposed for those holding Special Responsibilities (SRAs), and for the Mayor. If agreed the Tower Hamlets allowances will become fairly average for London and our Mayor would remain the lowest paid. If the Council agreed the change to my allowance I would only take half of it, with the other half next year provided we have made further progress in sorting the Council out. As a further consideration for members, particularly those who rely on their allowances for a significant part of their income, it is worth noting that the Government recently banned members from membership of the pension scheme, which included employers contributions of over 10% on top of their allowance. This loss is partially also reflected in the updating of allowances proposed. As far as the cuts argument is concerned: there is never a good time to agree allowances, but all are within or below the range suggested by an independent panel for all London councillors, whose report guided us. However, the increased cost of about £46,000 should be considered against the saving of about £300,000 in the costs of operating the Mayor’s office, and the mayors allowance compared the the scrapping of the chauffeured car, which saved about £30,000 a year. A comparison with council staff is tempting but is based on soft foundations – whereas for example many council officers receive increments, promotions or upgrading, plus an annual increase in most years, elected members have no such opportunities and do not have secure employment as councillors, while making in most cases great personal and career sacrifices. It’s quite right that these are tough times but the proposals are a recommendation and up to the Council to agree or reject. As regards my workload and whether I am worth a reasonable pay that is for others to judge, but I work at least 80 hours a week, am at my desk by 7.15am most mornings, getting home normally after 10pm. As an indicator, I read and respond to about 1000 emails a week, with more than this dealt with by my office. The council is in a worse state than I had expected – beyond the headlines of the misbehaviour of the previous mayor a whole number of key decisions had been missed, in an outrageous failure of leadership. Were it not for the superb effort and commitment of many of our officers we would be in a far worse state. I anticipate working at this level for the foreseeable future. The previous Mayor on the other hand, as far as I can tell, rarely appeared before the afternoon, generally failed to keep appointments, never sent emails on official business and appears to have ‘kicked the can down the road’ where leadership was needed. Those who said he was a hero should more accurately perhaps have scored him as a zero. And the borough will take some time to recover. It takes serious and dedicated effort to do that. An executive mayor is full time job. If he had more hair, John I’m sure would say he’s a L’Oreal mayor (“because I’m worth it”.) Is he? What do you think? Personally, I think if he does the job well, he deserves it. I have more concern over SRAs paid to other councillors, and it will be interesting to examine who gets which posts for the coming year and then to check their attendance records thus far. 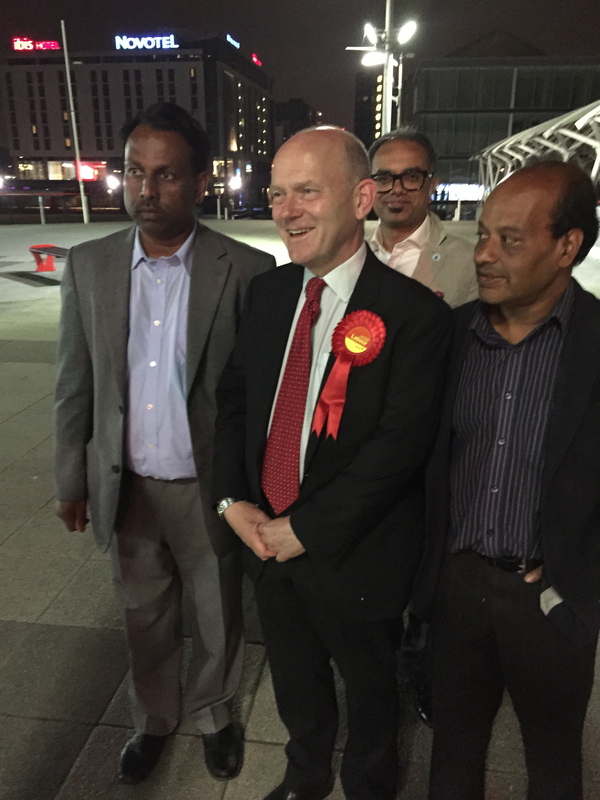 John Biggs is to be congratulated for winning the re-run Tower Hamlets mayoral election. The result was a clear rejection of Rahmanism and of Rahman’s proxy candidate, Rabina Khan. We now expect John Biggs to ruthlessly root out the rest of the corruption at the town hall within the three years left in his mandate. If he starts to do this, he can be sure of my and many others’ co-operation. But he and the Labour Party must also now reflect on the fact that it was Labour that created the crisis in the first place. That is why Labour was so hostile towards the Election Petition initially and made various attempts to sink it. Biggs himself was a very reluctant witness who had to be coaxed for months to provide an adequate statement for the court. Almost all other local Labour “leaders” looked the other way. One allegedly actively dissuaded people from giving evidence. What is the point of leaders who lead from the back? There remains a question hanging in the air. Everyone knew that election corruption was rife in Tower Hamlets. It’s been going on for years, so why didn’t anyone, apart from Ted Jeory, Andrew Gilligan and Mark Baynes, do anything about it? Remember, Rahman was, and in many ways still is, a Labour man. So the choice in the election was really between Labour and Labour. Return of the One Party State of Tower Hamlets. 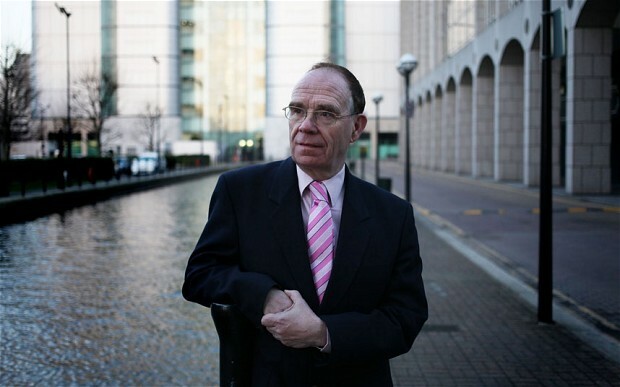 Rahman claimed in the election court that senior Labour officials such as Keith Vaz, Ken Livingstone and Len McCluskey had met him and his deputy Alibor Chaodhury and that they had agreed a “pathway” with the party leadership for Rahman to get back into the Labour fold. The Labour leadership has never denied this dirty deal behind the backs of both the Labour Party membership and the electorate. In my view, the only thing that stopped it being implemented was a spanner in the works in the form of the Election Petition. My reading of Biggs’ victory speech last Thursday was a hint at some form of reconciliation with Tower Hamlets First group councillors. Too eager, too much, too early. Last year Labour decided not to take an Election Petition itself against Rahman, even though it suspected that he had, once again, committed industrial-scale fraud in the mayoral and local elections. Maybe it was because historically Labour has also been involved in similar tactics? Rahman learnt his skills from Labour. It’s all very well to talk about “drawing a line”, as Biggs does, but the body will only stand a chance of recovery if all the cancer is cut from the ailing body and we now know that election corruption was and is only the tip of the iceberg as regards corruption within the London Borough of Tower Hamlets. The cancer of corruption is still there. Intimidation and violence in local elections has not stopped in Tower Hamlets either. A few days before this election a Labour councillor was badly manhandled and bruised outside a mosque because he refused to support Khan. In typical style, he appears not to be pressing charges “on advice from the elders”. So supporters of Khan can get away with a potential crime? And you want these people back in the Labour Party? It’s my belief that numerous fraudulent and invalid votes were also cast again in Tower Hamlets and the police are investigating. If Khan is seriously considering her own Election Petition, who will it be directed at? My advice to her is: save other people’s money. It will fail at the first hurdle and “be laughed out of court”. The police have acceded to my request to extend their enquiries to include the local councillor elections and the courts have agreed that ballot papers must be preserved a further six months. Complaints can be made direct to the Met at: SETelections@met.police.uk as soon as possible and before November at the very latest. I hear that local Labour leaders are already advising disappointed 2014 Labour candidates to leave matters – i.e. not co-operate with the police. And we wonder why so many local police enquiries run into the sand? If people are now being discouraged from making formal complaints to the police about last year’s local councillor election fraud, they will live with the terrible consequences for years to come. Incidentally, it has never been clear why Chris Weavers, Labour’s then election agent and local Party chair, failed to challenge any of the poll counts on May 22 2014 at the time. Looking back, was his inaction wise? It will also be especially interesting to see whether Biggs will root out corruption connected with local land deals. Scotland Yard is actively examining allegations of very serious fraud and misfeasance in public office on this aspect. It will be interesting to see if the new mayor opens up all the books to a serious and robust police investigation or concentrates on “reputational” issues like a public affairs consultant for FIFA. There is also the small matter of the fraud issues coming out of the PriceWaterhouse Coopers’ investigation. Why is Scotland Yard turning a blind eye? There must be a reason. The only aggravation I had on the streets was from a few self-styled Biggs aides who criticised me for ‘splitting the Labour vote’. No vote belongs to Labour. Like respect, every vote has to be earned. Such arrogance has destroyed the ethical power of the Labour Party. It is anti-democratic and indeed illegal to seek to pressurise voters and candidates. Don’t they know? I take it as a badge of honour. Remember Labour created Rahman. Furthermore, the spectre in the election campaign of both Peter Golds openly boasting in public meetings that he would “lend” second preference votes to Labour, and of Biggs “lending” Labour’s second preferences to the Tories beggars belief. Have these people learnt nothing? We will now see if Labour will clear up, or cover-up, the mess of its own making. His Twitter handle is @Going4Golds and now he’s going for gongs. Already a proud holder of an OBE – unlike some he rarely uses the initials but he does wear the medal in the presence of the Queen – Peter Golds is now being made a CBE, which is of an altogether higher rank. He’s been awarded it for “services to local government” and undoubtedly his work in Tower Hamlets over the past decade, but particularly in the last five, has won it for him. He’s the toast of the Isle of Dogs – and further beyond. Unlike some nonentities in Tower Hamlets politics, he doesn’t have a Wikipedia page, but he does appear in Wikipedia…on Norma Major’s page. It was he who introduced her and John Major. A true man of history! John Biggs delivered a far more generous victory speech last night to the Tower Hamlets First brigade than they perhaps deserved. It wasn’t what he said precisely but the tone he used. 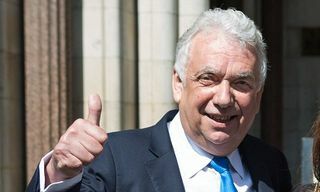 I suppose it’s easy and better to be magnanimous in victory than to be crowing and churlish but he congratulated Rabina Khan for her campaign (who, by the way, didn’t reciprocate in her speech – she forgot to say well done and instead focused on the ‘me, me’ parts) and he promised to recognise the fact she polled so many votes. She won almost 26,000 votes on the first round, 1,500, or less than 2 per cent, behind John. He said we shouldn’t forget that “a lot of bad things have happened” but that we should now move on. He said he would hold office as a Labour mayor but in also praising Peter Golds he hinted at possible cooperation to come. Peter, in his speech, struck a more wary tone. He said John won by “borrowing” votes from the other parties. As he said this, John raised a somewhat surprised eyebrow, but given the comments on this blog and on Twitter during the past couple of days, as well as the feedback John’s opponents were getting on the doorstep, I think Peter was doing no more than stating the bleeding obvious. Peter polled 5,940 votes, or 8.7 per cent of the first round total. This was almost the same as Chris Wilford achieved last year in percentage terms (he got 7,173 votes in total) but far below the 20 per cent the Tories achieved only last month in the general election for the borough’s two constituencies. And in second preference votes, there were a huge number of Tories who put Labour second yesterday. For sure, this was an election in which Labour found friends in other parties. I know that had John won last year he’d been planning to create an administration reflective of the rainbow nature of his support. It would be very surprising were that not the case this time. The Government commissioners (who like almost all senior council officers will have been relieved by the result) will surely leave once they see functional politics at play again. This is why Peter was right in his speech at the ExCeL centre to warn about the consequences for THF of last night’s defeat. Where do their band of jokers go now? Labour and the Tories will need to watch their backs when it comes to future candidate selection for councillors. More about them in a future post. But more immediately, John now has to create an administration. He has already appointed three deputy mayors in Rachael Saunders, Shiria Khatun and Sirajul Islam, but there will be others wanting some reward. It was noticeable that Abdal Ullah, no longer a councillor, was the man who escorted John into the count last night. There’s now a cabinet and other appointments to be be made. Some in his Labour group will have to bide their time. Will John take a Sir Robin Wales approach and dish out special responsibility allowances like confetti? And how will he thank the Tories and in particular Peter Golds? Not so long ago, I suggested he’d make an excellent council Speaker. I think he’d love wearing the civic chains and ensuing order in the council chamber. Offering that role to him for a year would seem a wise choice. After that, I’d put him in charge of transparency and anti-corruption: a mini-Eric Pickles. And then there’s Rabina. Could John offer her something? Would he? Would she accept? A role to encourage more women into politics? It would certainly create a split in the group of 17 “independents”. Or would she prefer to lead their group as Opposition leader. If the latter, she will need to formally join them and then take on Oli Rahman who has assumed that role. And there is some talk about Rabina’s team examining a possible election petition against John’s win but how serious that is and on what grounds, I’m not sure. Lastly, congratulations to Labour’s Sabina Akhtar for winning in Stepney and to Andy Erlam and the other petitioners. Andy polled 1,768 votes yesterday – less than 3% – but his fans are of a far, far higher number than that. Meanwhile, here are some photos of last night’s fun. Lutfur Rahman will be appealing the judgment made against him at last Thursday’s election court. He continues to reject all claims of wrongdoing and we hold that the integrity of the court system was marred by the bias, slurs and factual inaccuracies in the election judgment. There is a petition in his defence available here for those who wish to sign and a rally will be held on Thursday. Tower Hamlets First councillors reject the election court’s claims that we are nothing more than a ‘one man band.’ We support Lutfur Rahman as a party because he has led in delivering record numbers of social and affordable homes, investing in our young people with maintenance allowances and university grants and standing up to Tory and Labour austerity. We support former Councillor Alibor Choudhury because of his record as Cabinet Member for Resources of doing the hard work needed to make these policies happen. As such we will continue to serve residents. Whilst Lutfur Rahman appeals, Councillor Oli Rahman has stepped in as acting mayor and will be working to ensure that top quality Council services continue to be accessible to all residents. While other parties obsess over the politics of the past, securing decent jobs, fair housing and excellent support services for our borough will continue to remain our top priority. We will also be deciding this week on a candidate to endorse in the forthcoming mayoral election and election for Stepney Ward, and we will make that decision based on who we believe is best placed to deliver stronger communities and a fairer future in Tower Hamlets. At least they describe Alibor as a “former councillor”. @TedJeory It was an unorthodox judgment in style; but the legal substance was sound. And Rahman cannot appeal on the factual findings. More of this to come. At some point we will also no doubt find out who has been paying Lutfur’s hefty bills. 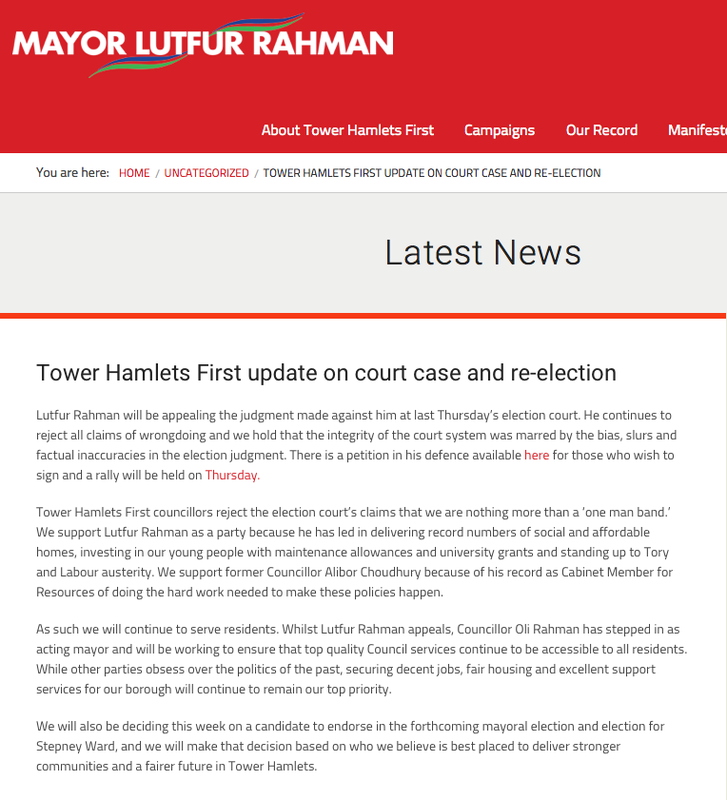 In the meantime, a quick update on the politics of Tower Hamlets First. 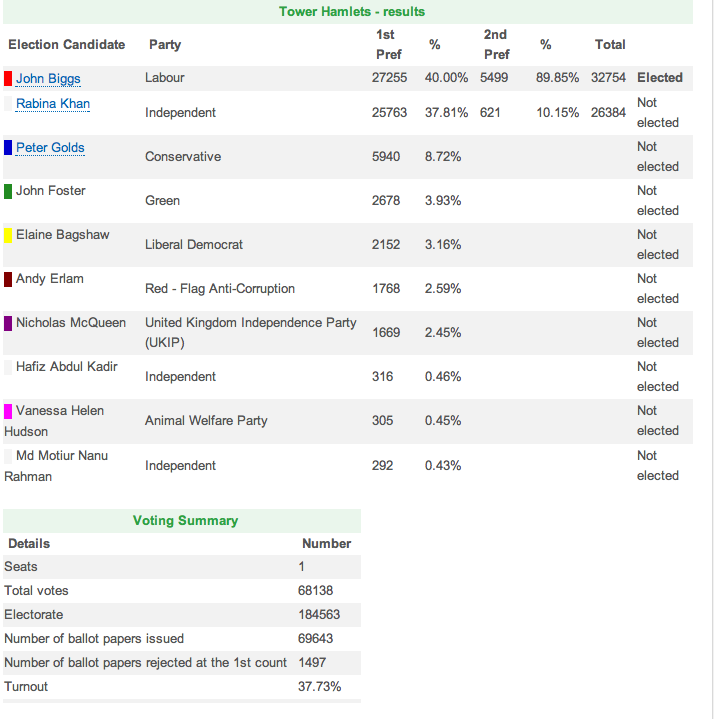 Acting mayor Oli Rahman and Rabina Khan appear to be the frontrunners. And it is Lutfur himself who will decide. He is, according to sources, “taking soundings from leaders of community groups”. Which groups these are have not been specified, but one will certainly be the Islamic Forum Europe. Anyone who underestimates the influence the IFE has on these things is mistaken. As for Oli, he’s apparently loving his new role. He’s been having regular meetings with the two Government Commissioners and promising to work closely with them. I’m told they’ve respected him for that. It’s not something that Lutfur did. In fact, he would be a change from Lutfur in other respects. He’d scrap the mayoral car and chauffeur for a start and take public transport (and not cabs as he used to do…). He would also only hire mayoral advisers where “absolutely necessary”. But while he’s enjoying the role, it’s not clear for how much longer he can carry on doing it. The executive mayoral role is full time and I’m told that Whitehall rules forbid civil servants from carrying out that job. Oli, of course, is a civil servant with the DWP. And the DWP has apparently written to him to say that Eric Pickles’s DCLG has highlighted this little headache. Oli is enlisting the help of Unison, so watch this space, but it is possible that Oli may have to vacate his acting mayor role before the mayoral by election in which case someone else may have to step up. Meanwhile, as you all know, Andy Erlam has decided to stand. If the Tories choose Peter Golds, among the main contenders it will be one British Bangladeshi versus three or four white men. The divisions will no doubt continue. I wish they’d all just hammer out a rainbow coalition deal.